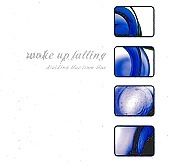 A driven collection of rock, Woke Up Falling's debut full-length is a melting pop of guitar-driven blasts of fury, soft, beautiful melodies, and emotionally tearing tales of pain and sorrow. Though, no matter how much the vocals bleed the pain they speak of, the band never lets you get too depressed or down on yourself (or them), for they always have enough going on to keep you entertained and enjoying yourself. This is one of the few albums this year that emo kids will enjoy; yet nobody will consider this album emo. Avoiding traps and playing the rock, Woke Up Falling deliver. I'll give this a B+.